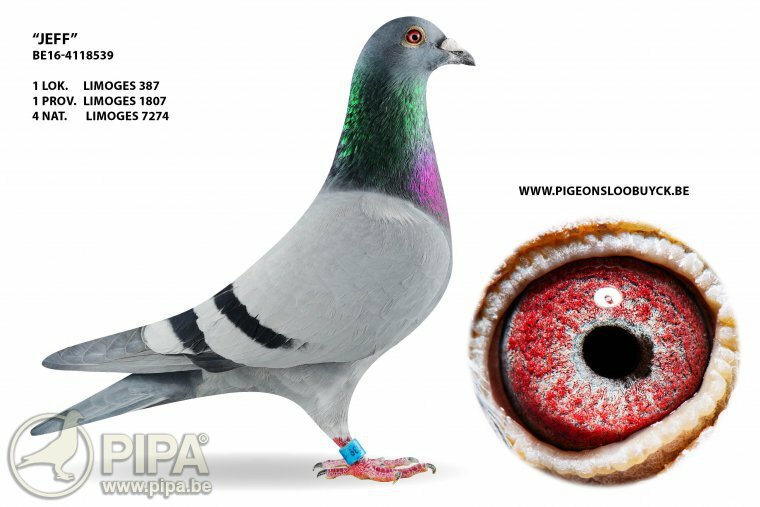 The Loobuyck pigeon breed had some fantastic results again in 2018, claiming two provincial first prizes from Brive and Limoges II, as well as a title of 4th National Champion Long Distance and Extreme Long Distance YLs KBDB. This year's results were consistent with their previous two seasons, which were a great success as well: they won a 1st national Montauban and a 1st Nat. Ace Pigeon Long Distance old birds KBDB in 2016, as well as a 1st national Jarnac in 2017. Keep in mind this father-son combination has a rather small racing team, especially compared to most other long distance lofts. This makes their palmares all the more impressive. 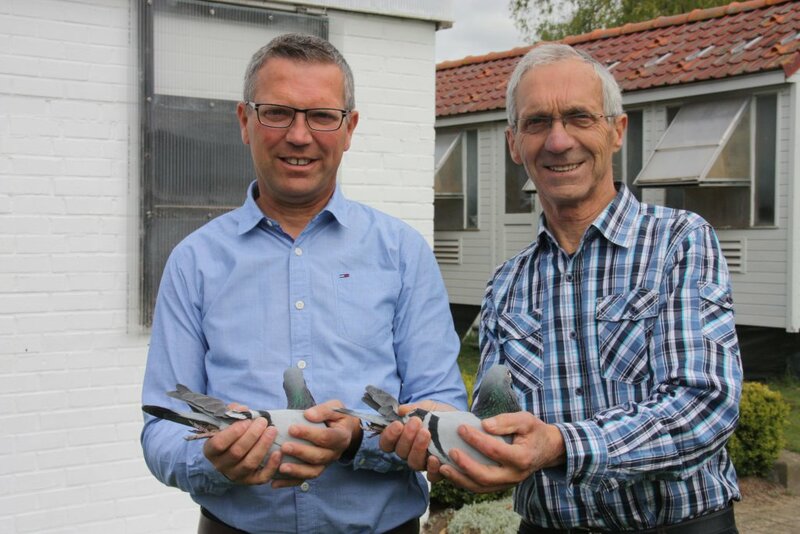 The city of Aalter – home to mayor and minister of internal affairs Pieter De Crem – is home to quite a number of successful pigeon fanciers. Jozef (often nicknamed 'Jos' by his friends) and his son Jan Loobuyck have been in a successful combination for several years. Grandson Jens looked like he was about to join the combination one day as well, but those plans changed when he started a pilot training course, which is difficult to combine with a pigeon racing career. But that does not mean Jens has lost his passion for the sport. He is the biggest supporter of father Jan and grandfather Jos. And they were close to winning another national first prize: they claimed a 2nd Nat. and 2nd Inernat. Marseille in 2001 (a mere two seconds behind the winner). They also lost a national first prize from Bordeaux in 2011 due to a control ring not being clocked in time. Their bird eventually had to settle for 5th national. Over time, the Loobuyck pigeon family developed an international reputation. The winner of a 1st Nat. Perigueux eventually became the stock sire of this breed. He is a truly fantastic breeder, and most of the team's recent achievements in the long distance can still be attributed to this bird: basically every top bird is related to him. His grandson Bordeaux eventually followed in his footsteps, in turn breeding several successful birds in the long distance and the extreme long distance. Bordeaux and Perigueux are now the cornerstones of this team, along with Fonne (from the late Alfons Hoste), a group of birds of Chris Hebberecht, the line of a 1st Nat. Castres of Hendrik Mortier, and a hen of Van Damme-Boddaert. In the meantime, the team also exchanged pigeons with other renowned lofts, with some promising results. But they decided to not yet reveal their names until further notice. -Fonne BE05-4071032 (winner of 1st club and 40th Nat. Narbonne 6,801 p.) x Superkweekster BE09-4101722 (a granddaughter of 1st Nat. Perigueux): the parents of a 1st Nat. Montauban 4,327 p., a 3rd Nat. Montauban 3,990 p., a 59th Nat. Souillac 3,641 p., a 75th Nat. Argenton 22,284 p., an 89th Nat. Narbonne 4,571 p., a 147th Nat. Barcelona 8,764 p., a 195th Nat. Barcelona 10,542 p. etc. -Bordeaux BE07-4214274 (moral winner of a 1st Nat. Bordeaux in 2011, and a grandson of a 1st Nat. Perigueux) x Nest sister Fantoom BE08-4146457 (Fantoom – 2nd Prov. 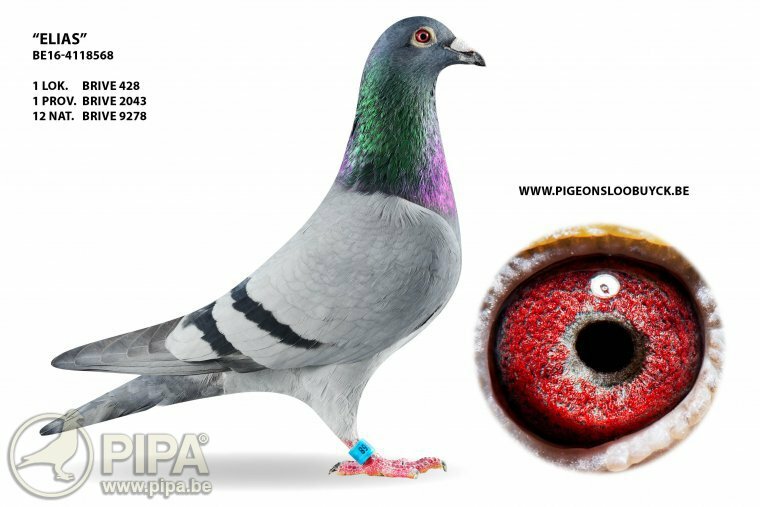 Ace Pigeon Long Distance KBDB - the supercrack in the lofts of grandson Jens Loobuyck, and a grandson of a 1st Nat. Perigueux). They are the parents of Spirit, winner of a 1st Nat. Ace Pigeon Long Distance KBDB 2016. -That same Bordeaux BE07-4214274 was also paired to Bungaduivin BE04-3160649: they are the parents of Bunga Bordeaux, 10th Prov. Ace Pigeon Long Distance KBDB, and winner of a 65th Nat. Poitiers 13,135 p., 70th Nat. Tulle 5,976 p., 55th Nat. Limoges 7,221 p.
Long story short: this is a fantastic group of breeding birds based around national race winners, occasionally combined with the bloodlines of other renowned racing birds and top teams from around the neighbourhood. However, these newcomers have to prove their worth in the racing loft first, before they are introduced in the breeding loft. One of their best breeders of today, De Keikop, is a good example of this approach. This team from Aalter focuses mainly on the long distance and the extreme long distance with the old birds. Their results as young birds are not all that important, they mainly have to gain experience for later on. At the age of one, they have to complete two national long distance races, where they should at least deliver a few decent results, or perhaps a few prizes per 10. The long distance racing birds should be on top of their game by the age of two, and they are now required to win top prizes in order to make it through to the next round. The fanciers expect a lot from their birds at this stage: after about four years of racing, only the very best birds will be selected for a transfer to the breeding loft. And that is what makes this team so strong: they race with a limited number of birds, keeping only their best pigeons. And these super class birds have turned the Loobuyck family into a nationally famed breed. In 2018 they claimed two more provincial first prizes, and a top prize in the national championships KBDB: 4th Nat. Champion Long Distance and Extreme Long Distance Yearlings KBDB 2018. Here is a look at some of the team's best birds. A son of Bonte Hebberecht BE05-4347968 (a direct Chris Hebberecht) x Daughter of 1st Nat. Castres BE06-3051081 (a direct Hendrik Mortier). As her name suggests, she is a daughter of Jens Favourite BE11-4078440, winner of a 61st Nat. Barcelona 7,791 p., 75th Nat. Barcelona 8,764 p., 86th Nat. Perpignan 6,248 p. He was paired to Blauw Peiren BE11-4078451 (the line of Klamper x Nika, two stars of Noël Peiren, crossed to the bloodline of Roger Florizoone). Elias is obviously a talented bird and a natural born winner. It shows once more that champions breed champions. This fantastic bird worked really hard in the demanding race from Limoges II in early July, claiming victory in hot and tough weather. A son of Keikop BE06-4064270: winner of a 6th Nat. and 15th Itnat. Tarbes 12,537 p., a 57th Nat. Montauban 5,438 p., a 64th Nat. Tarbes 4,812 p., and a 109th Nat. Brive 17,546 p., and a son of Bonte Hebberecht 968/05 x Hendrika 170/03 H.Mortier. Keikop was paired to stock dam Daughter 20 BE04-3160649 Van Damme-Boddaert (a half sister of Warrior, 1st Nat. Ace Pigeon Long Distance KBDB 2015 for Team Freddy De Jaeger). A super class breeding bird and the dam of Jens Favourite: winner of a 61st Nat. Barcelona 7,791 p., 75th Nat. Barcelona 8,764 p., 86th Nat. Perpignan 6,248 p., and a 100% Chris Hebberecht from Son Torjaan BE05-4347964 (winner of Golden Oscar Flanders Cup) x Granddaughter Pancho BE05-4347970 (Pancho was 1st Prov. & 2nd Nat. Ace Pigeon Long Distance KBDB). A brother of a 1st Nat. Montauban 4,327 p. in 2016, and a son of Fonne BE05-4071032 (winner of a 1st Club and 40th Nat. Narbonne 6,801 p.) x Superkweekster BE09-4101722 (from son 1st Nat. Perigueux: Vechter 191/98 x stock dam Daughter 20 649/04 of Damme-Boddaert). A daughter of Alfa BE10-4173123, a full brother of Stouten (1st Prov. Tulle, 1st Ace Pigeon Long Distance Meetjesland), Superkweekster etc. (from Vechter191/98 x stock dam Daughter 20 – Van Damme-Boddaert). He was paired to Geschelpt De Rauw BE09-4101766, a direct Etienne De Rauw (from the best of Marcel Aelbrecht: line of Goede Blauwen x granddaughter Marseille). Team Loobuyck is particularly fond of pigeons that give a hint of their potential already in the yearlings' category, for instance with an early arrival or a prize per 10. Onix and Florian are two birds that were very promising one year olds, both winning a first prize winners in the long distance. Jos and Jan believe that they both have a promising future. 11th  Nat Tulle     5,326 p. ’18  - 4th Prov. 972 p. – 1st club 130 p.
150th Prov Bourges  3,886 p. ’18 – 668 Nat 19,133 p.
196th Prov Argenton 4,556 p. ’18 – 623 Nat 19,859 p.
A genuine Chris Hebberecht bird from Son AXL BE07-4373150 (AXL: 1st Nat. Ace Pigeon Extreme Long Distance KBDB ’05) x Daughter Half Sister Ike BE12-4165714 (daughter Super 609 of Michael Rodts x Half sister Ike – Hebberecht). She comes from stock breeder Bordeaux BE07-4214274 (moral winner of 1st Nat. Bordeaux) x stock dam Daughter 20 BE04-3160649 Van Damme-Boddaert. 19th  Nat Angoulême 5,030 p. ’18 – 5th Prov 1,374 p. – 1st club 195 p.
68th  Prov Limoges 2,138 p. ’18 – 171st Nat 7,236 p.
143rd Prov Chateauroux 5,209 p. – 892nd Nat 27,081 p.
A full brother of Chris (the sire of Elias). A son of Bonte Hebberecht BE05-4347968 (a direct Chris Hebberecht) x Daughter 1st Nat. Castres BE06-3051081 (a direct Hendrik Mortier). A full sister of a 1st Nat. Montauban 4,327 p., a 3rd Nat. Montauban 3,990 p., a 59th Nat. Souillac 3,641 p., a 75th Nat. Argenton 22,384 p., an 89th Nat. Narbonne. She is a daughter of Fonne BE05-4071032 (winner of 1st club and 40th Nat. Narbonne 6,801 p.) x Superkweekster BE09-4101722 (from Son 1st Nat. Perigueux: Vechter 191/98 x stock dam Daughter 20 649/04 Van Damme-Boddaert). Team Loobuyck does have quite a collection of top class long distance champions in their collection. As you know, this team races with a small group of high quality birds that excel in the long distance season after season. -Sjaak van de Velde & Zoon (Breskens, NL): winner of a 3rd Nat. & 7th Intnat. Agen 5,900 YLs ’17 (line of Keikop-Loobuyck). They also win a 22nd Nat. St.Vincent 2,570 p. and an 89th Nat. Pau 3,551 p. in 2018 with a grandson of Fonne x Superkweekster! -John Meurysse (Oeselgem, BE): he wins a 1st Prov. and 2nd Nat. Ace Pigeon Long Distance KBDB in 2014 with Dieudonné. The dam of this top bird was Vaillant, a 100% Loobuyck hen. -Com van Wanrooij (NL) bred their Valesco 193/15 from that same Vaillant. Valesco wins a 1st NPO Argenton 3,817 pigeons. -Manuel Pereira (Fr) have an excellent breeding dam: Loobuyckduivin 473/12 (from Nest brother Keikop x Daughter Stouten). She is the dam of several talented birds, including the winners of a 1st Bergerac 2,304 p. and a 1st Montluçon 1,284 p.
-Injon-Vanrie (Beernem, BE): they win a 1st Nat. Gueret 5,331 olds in 2018. 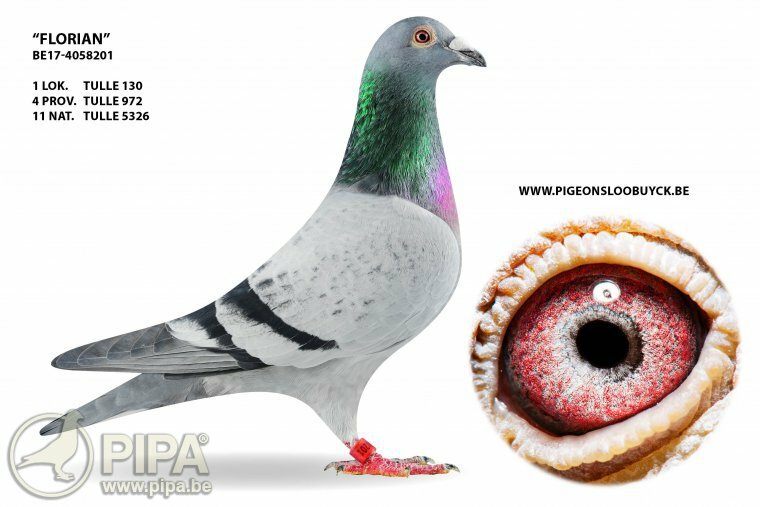 The dam of this pigeon comes from the line of Pursang Loobuyck, winner of a 2nd Nat. and 2nd Intnat. Marseille in 2001. -Koen Crucke (Onkerzele, BE): he wins a 3rd Prov. and 11th Nat. Bourges 19,063 YLs in the national race from Bourges I in late May 2018. The sireo f this pigeon is a son of Keikop – Loobuyck. To summarise, the pigeons of Loobuyck have won several victories and top results, even at national level, both for Jos and Jan Loobuyck from Aalter, and for numerous other fanciers that invested in these birds. It says something about the breeding and racing potential of these birds. These are natural born winners indeed. As you know, Jos and Jan prefer to race with a select group of birds, as you can tell from their results in 2018: great results with a small team. Winning provincial, zonal or even national first prizes in the long distance and the extreme long distance with a limited numer of birds is quite a challenge indeed. Congratulations!